With Giving Tuesday under our belts (early tallies show up to a 30% increase over last year), and the season of giving in full swing, it’s essential to make sure that within the frenzy of asking… asking… asking… you have a strong plan for saying THANK YOU. It’s not just a question of whether you’re sending an acknowledgement letter. It’s a question of how your gratitude efforts can create a strong and memorable impression. Amidst so much need and so many social, cultural and civic organizations vying for support, differentiation matters. 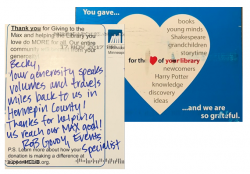 The Friends of the Hennepin County Library recently executed a perfect example. After their mid-November GiveMN nonprofit fundraising day, handwritten postcards were sent to all donors. This one arrived (half-way across the country) in an impressive four days! How will you make your donor experience memorable this month and in the year to come?